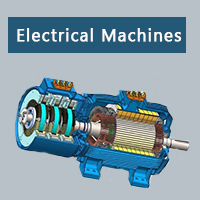 Electrical Machine Tutorial provides basic and advanced concepts of Electrical Machine Library. Our Electrical Machine Tutorial is designed for beginners and professionals both. Our Electrical Machine Tutorial includes all topics of Electrical Machine Tutorial such as Electrical Machine Introduction, Single Phase transformer, Open circuit test, Short circuit test, Regulation and efficiency of transformer, Three phase transformer, Parallel operation, Auto-transformer, D.C. Machines, Three-Phase Induction Motors, Single phase induction motor, Synchronous Motor, etc. Before learning Electrical Machine Tutorial, you must have the basic knowledge of electrical components. Our Electrical Machine Tutorial is designed to help beginners and professionals. We assure that you will not find any problem in this Electrical Machine Tutorial. But if there is any mistake, please post the problem in contact form.